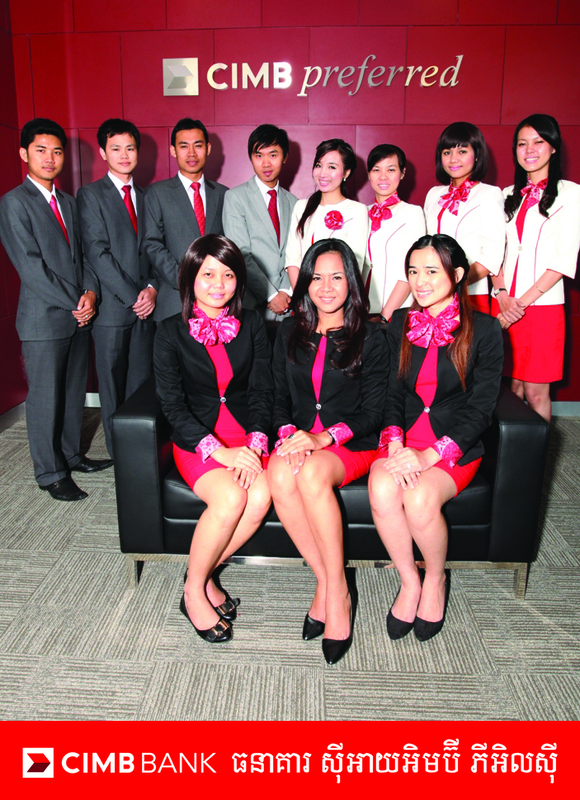 Established in 2004, SentoSaSilk specializes in high-end formal wear such as women dresses and jackets, men jackets and uniforms for banks and airline staffs. The price ranges from US$49 to US$279. Aside from garments, the shop also produces home products, fabrics and fashion accessories such as pillows, curtains, table runners, jewelries, shoes, silk wallets and purses, post cards and many e the two main materials used. The types of machines used for the production are Brother and Singer for sewing and linking. 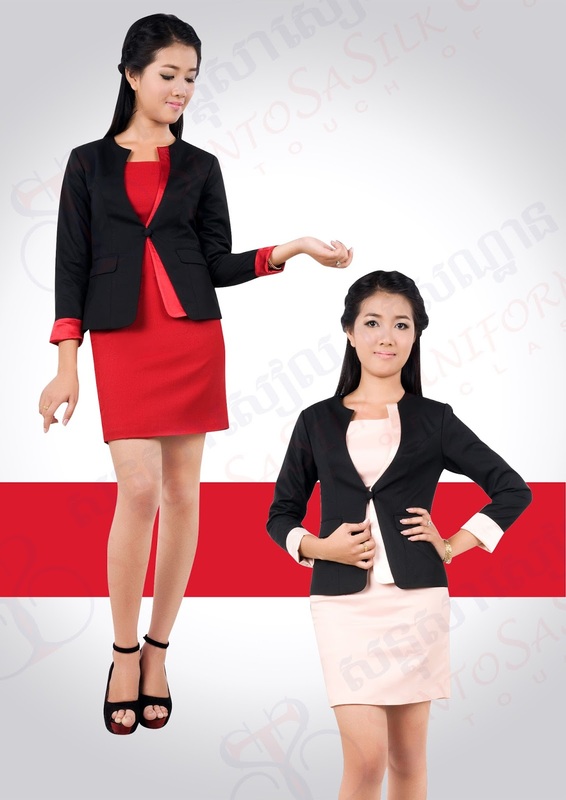 SentoSaSilk joins trade shows once to twice a year in collaboration with the Ministry of Commerce, the Korean Center, the ASEAN Japan Center and other networks to have a booth in the trade at least one a year in Korea, women dresses and jackets with price ranging from US$99 to US$279. The peak season is from. 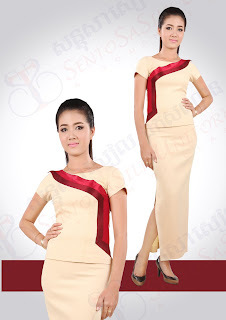 September t May where people buy dresses for wedding occasions, traditional festivals or company staffs Silk and cotton SentoSaSilk Sampling takes about 3 to 10 days.ANZ Royal Bank Toul Kork and Independence Monument branches have a SentoSaSilk Magazine. 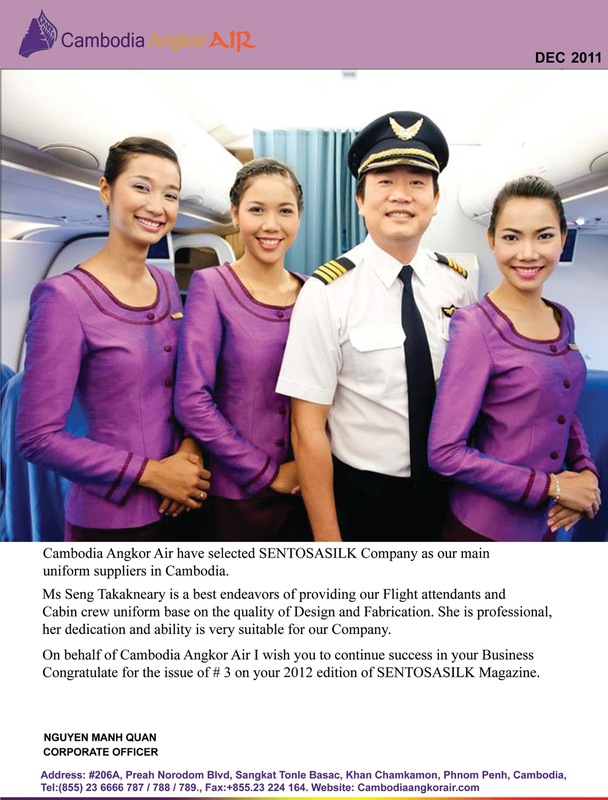 Cambodia Angkor AIR have selects SentoSaSilk Company as our main Uniform Supplier in Cambodia. range of services to fulfill your banking requirements and to provide you with discrete, efficient and world-class banking.With an emphasis on personalized and professional service, both your business and personal banking needs will be met by our specially trained staff. On behalf of ANZ Royal Bank i wish you to continue success in your Business Congratulate for the issue of # 3 on your 2012 edition of Ms Seng Takakneary is a best endeavors of providing our Flight attendant and Cabin crew Uniform base on the quality of design Cambodia Angkor AIR have selects SentoSaSilk Company as our main Uniform Supplier in Cambodia. 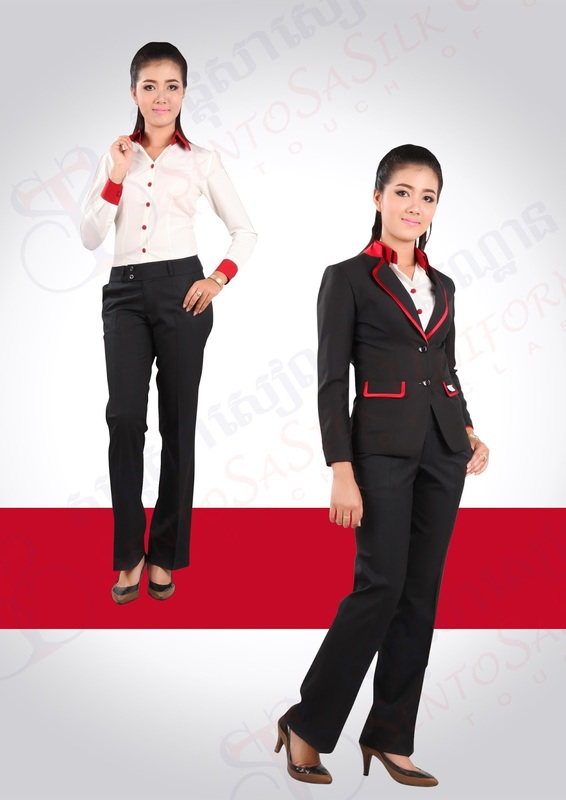 Ms Seng Takakneary is a best endeavors of providing our Flight attendant and Cabin crew Uniform base on the quality of design and the Artisans’ Association of Cambodia (AAC), a fair trade group Other cutting, buttoning and button-holing are done manually. Both materials and machines are bought from local markets in Phnom Penh. There are six designers which make approximately 20 to 30 designs every year. is one of the 32 members of dedicated to providing Cambodia’s most vulnerable people with opportunity to earn fair wages. AAC is supported by the World Rehabilitation Fund, International Labor It is also a member of the World Fair Trade Organization.to Germany is 100% and is under OEM basis. The best-selling item is women and men jackets. The shop provide designs and materials while the outsourced role is to do the cutting and sewing.total of 30 full-time and 70 part-time staffs including A those who were outsourced can produce up to 3000 pieces per month. Quality Control officers check the quality of the​​​​​​ products and is done at the production line.Minimum order is 100 to 300 pieces. Cartons and​​​​​​​ plastics are common packaging materials.Delivery time is 3 to 10 days. The Premier Lounges atare Thailand, Vietnam, Germany, Japan, Indonesia, France, China and Cambodia. For product development, the plan is to put more focus on decorative elements and the designs to generate more sales. 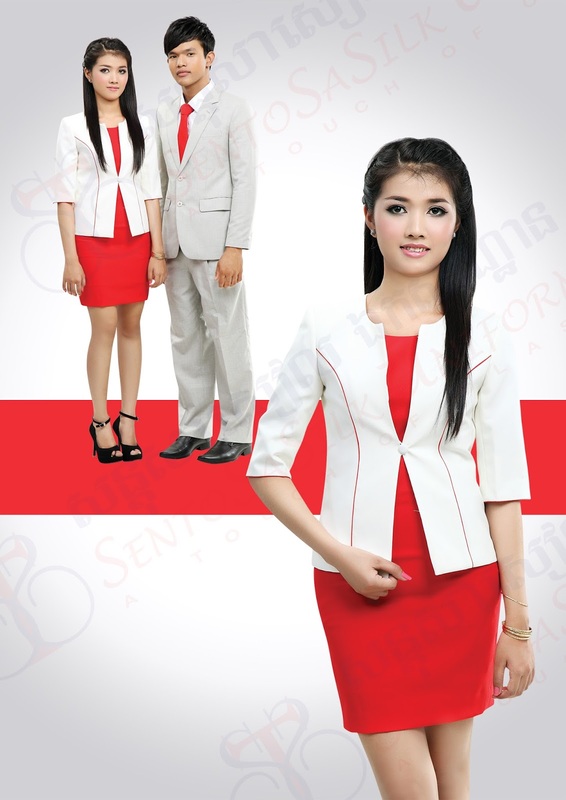 The shop outsources when there are large overseas orders - mostly women and men jackets. The shop provide designs and materials Organization and the United Nations more. Export for garment products Development Program. Fabrication. She is professional, her dedication and ability is very suitable for our Company. 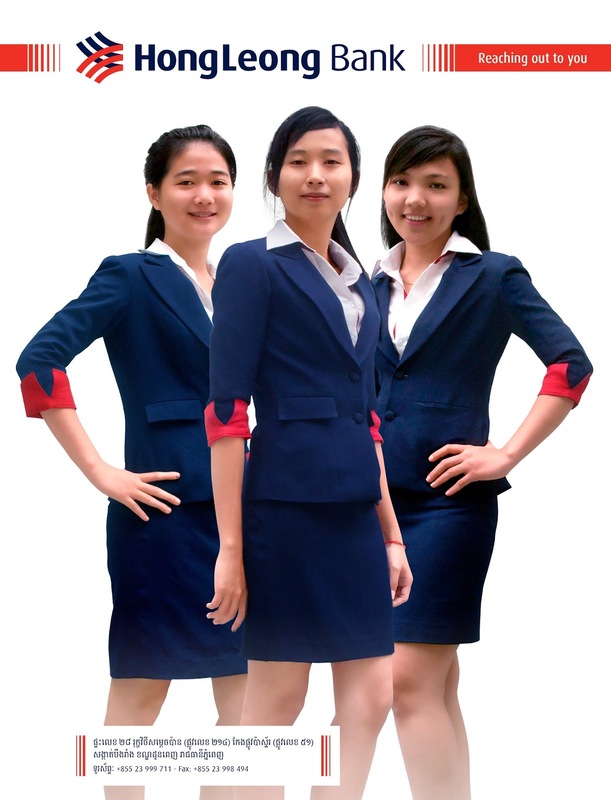 Ms Seng Takakneary of SentoSaSilk has done an excellent job on the production of our staff uniform service including design, within the project SentoSaSilk try their best to have completed her job even though the time is too short. We would like to recommend SentoSaSilk to other company and organization in need to quality service from uniform supplier. 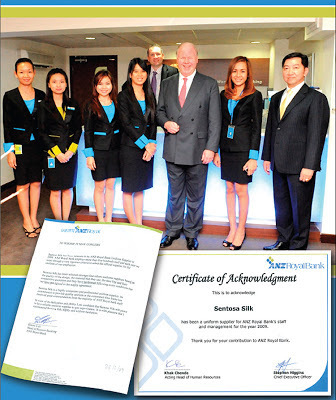 On behalf of Golden Fortune (Cambodia) Securities Plc. We would like to express my sincere appreciation to SentoSaSilk for the services and corporation. Uniforms for IHOP staff members - Dishwasher shirts, hostess shirts, hats, aprons and specialty items can be purchased or ordered for your convenience. This blog is very nice, the photos makes a great influence on the people who makes an effort to read blog on uniform and all stuff. I would like to share with you about Suiting and Shirting Manufacturing Companies in India It has superior quality of Suiting and Shirting Manufacturing Company. 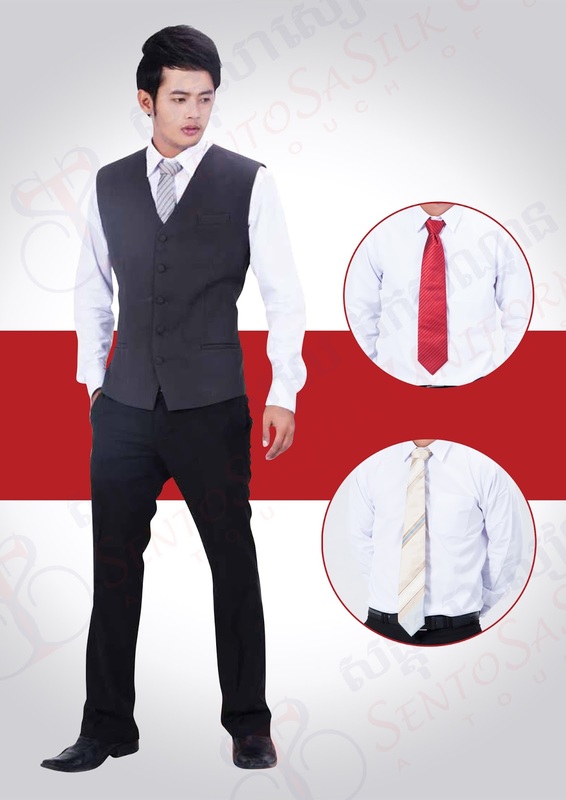 The quality of suiting and shirting has its own different method of manufacturing according to customers wants. The quality and variety of products have been attracted most of the customers and in case of price also. Manufacturing Textile Fabrics in India I am sure this company will help you in making you success in your life and your business. Thanks for this blog. This blog realy helpfull. Im seeking this type of blog from last 5 days. Thanks again for this nice topic. 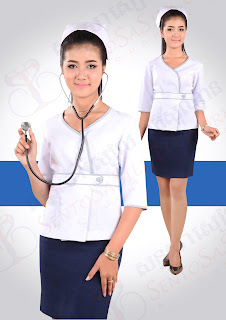 Thanks for sharing this kind of useful information pashion clothing offers best clothing service and uniform designing and all. Nice information.. Thanks for sharing.. We are among the most leading Promotional uniforms manufacturers in Pune for providing Promotional T-Shirts to our admired clients. 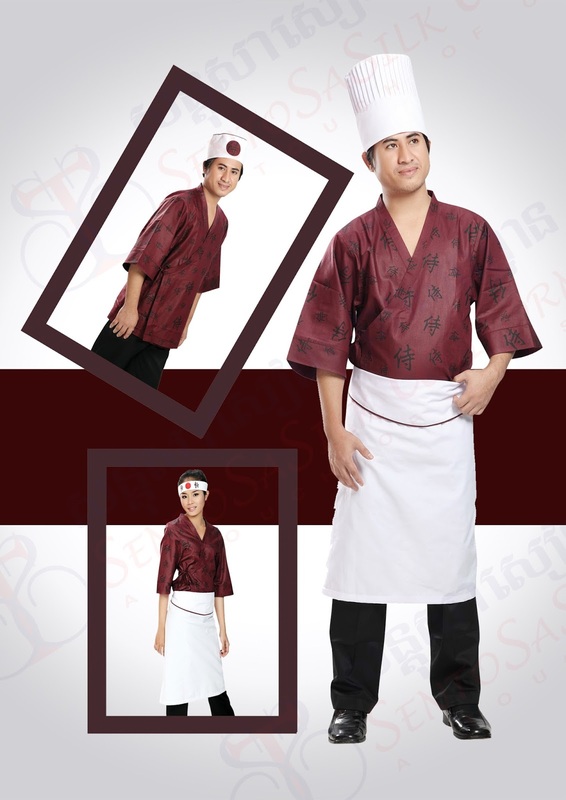 Hello man, I am really impressed by your post, Clever Designs also offers various types of Workwear Perth at an extremely low price. 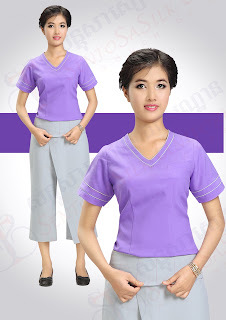 We are uniform manufacturers Company based in Delhi NCR and Company produce the various types of uniform in bulk quantity such as school uniform, hospital uniform, hotel uniform, airline uniform and corporate uniform. So contact us for bulk uniform manufacturing. 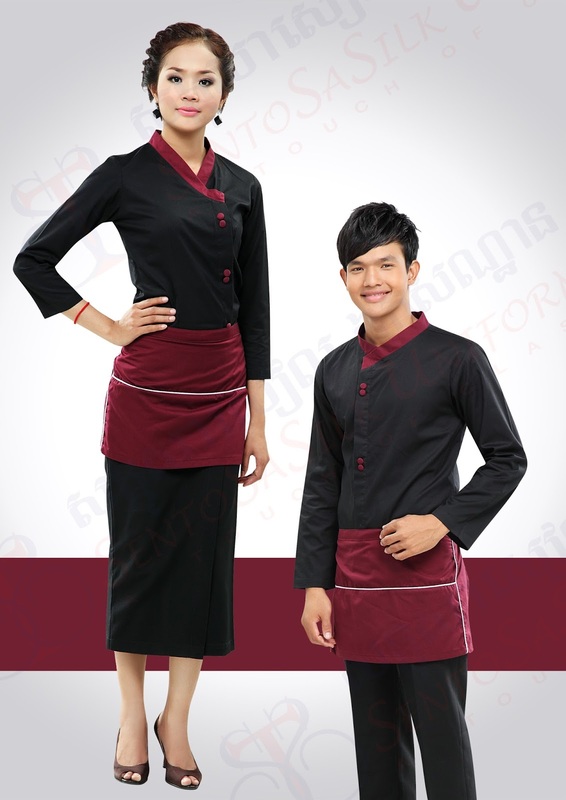 Such a nice hotel uniforms. I can see that this is comfortable to wear.